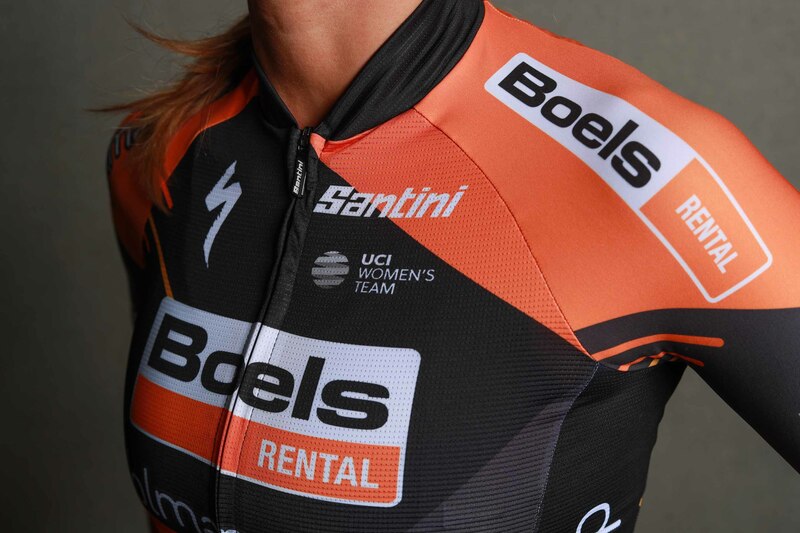 The partnership between the Boels-Dolmans women’s team and Santini Cycling Wear is to continue for 2019. Aside from supplying the race kit, the Italian company will also be creating a full line of garments to allow the girls tackle all kinds of weather both in training and in competition. Heat, humidity, cold and rain are just some of the weather conditions athletes have to endure in both competition and training. The right technical clothing can make all the difference. The Dutch Boels-Dolmans team is all too well aware of that fact and for the third year running has chosen to put its trust in Santini Cycling Wear’s skill and experience. The result is that the Italian company will flank the members of the prestige World Tour squad for the whole of 2019. The partnership is now in its third year and centres around the supply of both the race kit and a full range of technical wear for all four seasons designed specifically to meet the team’s needs while melding aerodynamics, performance, style and femininity in one sleek package. 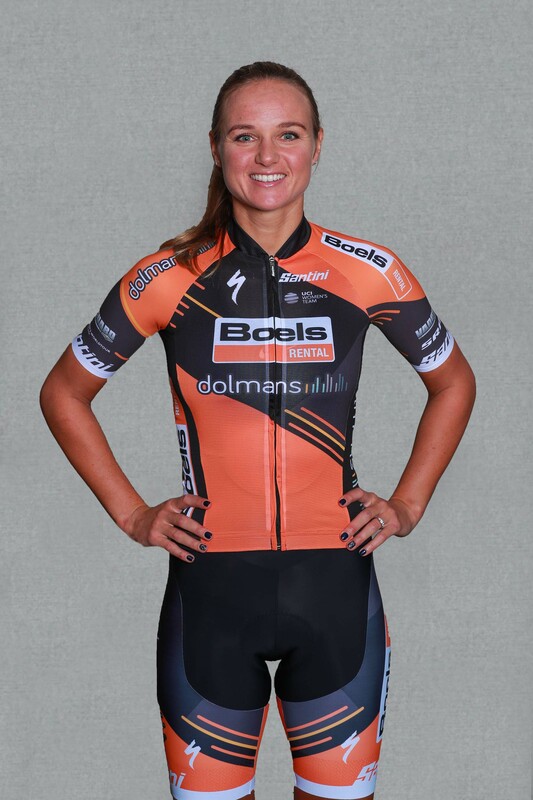 The new race kit the Boels-Dolmans team will be donning from next January comprises a jersey and bibshorts with an exciting new design. Black and grey have now be added to the colour palette alongside the classic orange that has always featured in the team uniform. The collar, central section and side stripe on the jersey will all be in black while the chest area, where the sponsor logos are located, will also include grey which is picked up again on the sleeve ends. Black is the main star for the bibshorts which also have a grey and orange section at the leg ends. The jersey is aerodynamically cut with front, collar, sides and back pockets all made from Rudy, an ultralight and highly breathable fabric. The back and sleeves, however, are made from Bodyfit fabric for a perfect second-skin feel. Raw-cut sleeves make the jersey even more comfortable while an invisible zip adds sleekness to the design and, together with the high collar, is the perfect finishing touch. The bibshorts are made from Thunderbike Power which exerts a gentle compression on tired muscles with personalisable New Monica fabric for the side sections. Stitching has been kept to an absolute minimum and the raw cut leg ends incorporate a silicon inner gripper. The chamois is the top-of-the-range C3 Woman which guarantees absolute comfort, lightness and shock absorption. It was made using Santini’s Carving technology method: it is carved out of two overlapping layers of foam to reduce volumes and create various thicknesses without any irritating stitching. In addition to the main kit, the team will also be supplied with a road skinsuit and a full range of apparel for all the seasons. The road skinsuit is in the same colours and has the same graphics as the main kit. It too is made from a combination of high performance technical fabrics: the ultralight, superbly breathable Rudy at the front of the upper and Bodyfit for the sleeves and back for a second skin feel. The legs are made from Thunderbike Power, a Sitp fabric that reduces muscle stress through gentle compression. The skinsuit also comes with the C3 Woman, a chamois pad designed especially for the female body. There are two standout new arrivals in the autumn/winter gear. The first is the Vega Xtreme jacket, designed for extreme cold, is made from Polartec Windbloc® to keep out wind, rain and damp whilst simultaneously delivering superb stretchiness, breathability and heat balance. The collar is also lined in soft cosy Polartec Alpha®. The second is the new bibtights with integrated underwear, so you can keep training on even the coldest days. Also from the Vega range, the athletes will be receiving a short-sleeve jersey made from Polartec which is designed for rain, and gloves and shoe covers to help protect them from wind and rain. Replicas of the kit and the other cycling wear developed for the Dutch team will be available from the team store, online from the Santini website (www.santinisms.it) and from select cycling stores worldwide.